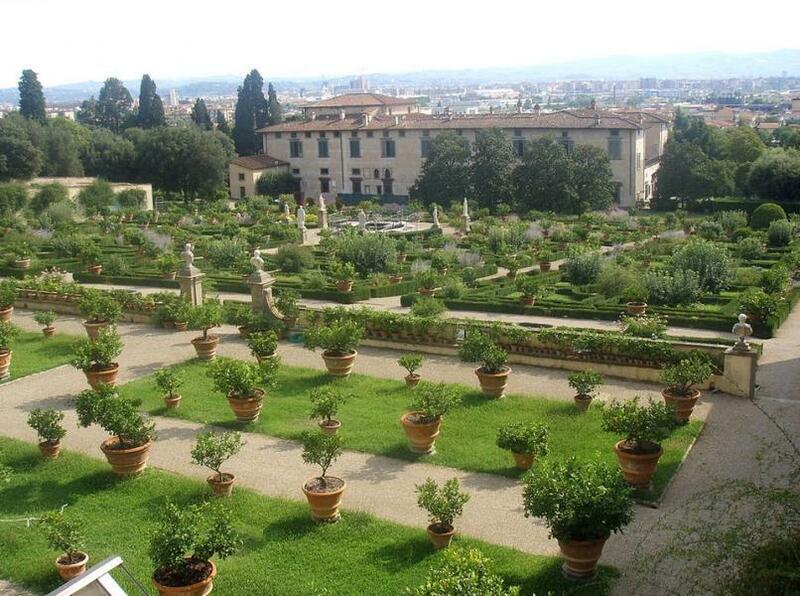 One of Tuscany’s most famous gardens is just down the hill from La Petraia, at Villa di Castello. The villa was bought in 1477 by Lorenzo di Pierfrancesco and Giovanni de’ Medici, cousins of Lorenzo il Magnifico who were Botticelli’s patrons, and they hung the walls of this villa with his mythological paintings that are now the stars of the Uffizi. The villa was sacked in the 1530 siege, then restored by Cosimo I, who spent summers here with his family, as well as his later years, when he increasingly left his governing duties to his son Francesco. Today is the headquarters of the Accademia della Crusca, the 'Academy of the Bran' founded by the Grand Duke Francesco I in 1583 as an antidote to the official, pedantic Accademia Fiorentina, founded in 1540. The Accademia della Crusca's main task was to 'winnow' the 'chaff' from the Italian language through its dictionary (the Vocabolario della lingua italiana, first published in 1612) to maintain the liveliness and purity of the language of Dante (its motto, from Petrarch, is Il più bel fior ne coglie ('She gathers the fairest flower'). Members, the 'Crusconi' regard their work as linguistic ‘baking’; one room has all their names carefully preserved, not on coats of arms, but on bakers’ shovels. For all the joking around, the Accademia della Crusca didn't mess around when it felt the pure Florentine language was threatened and in 1717 exiled a Sienese playwright, Girolamo Gigli, for publishing his humorous Vocabolario Cateriniano and daring to suggest that St Catherine of Siena wrote better than Boccaccio. Although at the time, the Vocabolario was burned in a public book burning in Florence, in recent years the Crusconi have begun to relent and are reconsidering its republication. While there is no admittance into the villa, you can visit one of the prototypes for the classic giardino all’italiana, was laid out for Cosimo I by Tribolo in the 1540s. Tribolo also designed the fountain in the centre, with a bronze Hercules and Antenaeus by Ammannati. Directly behind the fountain, a fantastical artificial stalactite cave, the Grotto degli Animali, is lined with pebble and seashell mosaics and filled by Ammannati and Giambologna with a fountain and marvellous, true-to-life statues of every animal, fish and bird known to man (some are copies of Giambologna’s originals in the Bargello). The shady terrace above offers the best view over the geometric garden below; Ammannati’s large statue of January, or Gennaio, emerges shivering from a pool of water among the trees. Beyond Gennaio is the woodsy English Garden, planted by the Lorraine Dukes. Via di Castello 40. Take ATAF bus ATAF bus No. 2 or No 28 and get off at Sestese 5.